English is a Latin language, and you can guess the pronunciation from its spelling, while Chinese is a character-based language, it can’t be spelt and you can’t guess the pronunciation from the characters. English has far less dialects and accents than Chinese. The written form of English is quite simple, while in Chinese it’s varied and that’s the cause of Chinese calligraphy. These differences taken into account, it’s really hard for the Chinese students to learn English easily, and they often make mistakes in their writing. According to study from teachers both home and abroad, below are some common errors that Chinese students make in their English 101 essays. Here we can also add errors involving singular countable and uncountable nouns where the s is included. For example, a pieces of cake (piece) and buy foods in the supermarket (food). A vivid example would be I very much thank you. In Chinese it’s 我非常感谢你，and the correct saying in English is Thank you very much. Another sample – Five flower meat (in Chinese it’s 五花肉, 五=five，花=flower, 肉=meat, the correct saying is streaky pork). I have a small (little) sister. My father is a teacher, my mather(mother) is a nurse. I have made great progres(progress) in learning English. Regular runing(running) is good for your health. He went to Guiyang, sitting in front(in the front) of the bus. She always complains for(complains about) the society. Who is the best (better) player, Ronaldo or Messi? I spended(spent) 2 days reading the novel. It taked(took) me 3 hours to finish the homework. it was the recess time. This is the common mistake for almost any Chinese student, because articles do not exist in the Chinese linguistic system. Thus, the absence of articles in Chinese indirectly influences them to commit errors when using English articles. Yesterday, I come(came) home very late due to traffic jam. It is(was) an afternoon at 1998 in France, I met my wife at Starbucks. He shouted so loudly yet no one heard him, because the house is(was) empty. 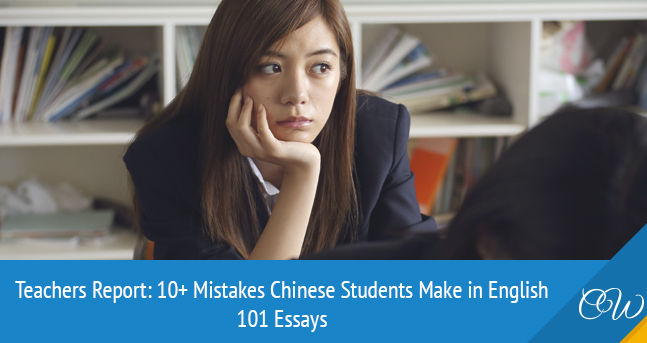 These are a few common mistakes that Chinese students usually make in their English 101 essays. As Chinese and English are two languages belonging to different language systems, it’s very normal for non-native speakers to have errors in their writing. However, always believe practice makes perfect. The more you practise, the better you will be!